Unlock creativity & teamwork using improvisation. We combine our expertise as business professionals and comedic performers to design a custom curriculum and lead an interactive workshop that will help your team grow personally and professionally. Impress with the nations top comedy and Variety acts. From emcee services to comedy and music acts we specialize in providing custom entertainment packages for private parties, corporate gatherings, weddings and any event in between. Raise money, awareness and spirits. Let us help you get the word out about your cause or charity with a unique event that offers people a fun way to give back. What people are saying about working with Team Us Comedy. 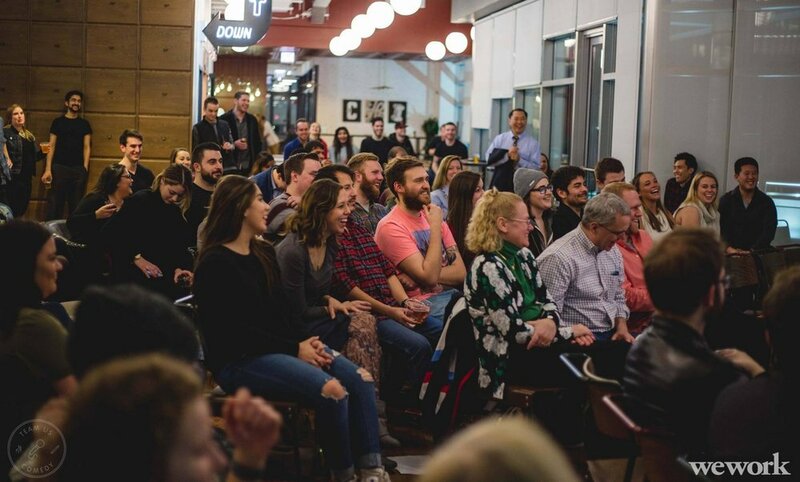 "Team Us Comedy designed an improv workshop for our annual all-team meeting and we LOVED it. It was fun, well thought out and got everyone to participate. We can't wait to have them back!" "We raised over $2,000 in one day with an event organized by Team Us Comedy. They handled everything from finding comedians that fit our organization and creating promotional materials to setting up the event and mingling with donors"
"[Team Us] Thank you so much for the amazing performance & emceeing of the Boarding on Hilarious showcase. We had an amazing time and got some much needed laughs! We would absolutely love to do it again!" "Team Us Comedy did a fantastic job putting togeather a custom show to celebrate my wife’s Birthday. Between stand up and improv they really got all our guests laughing with plenty of playful jokes about our friends and family. I highly recommend them!"